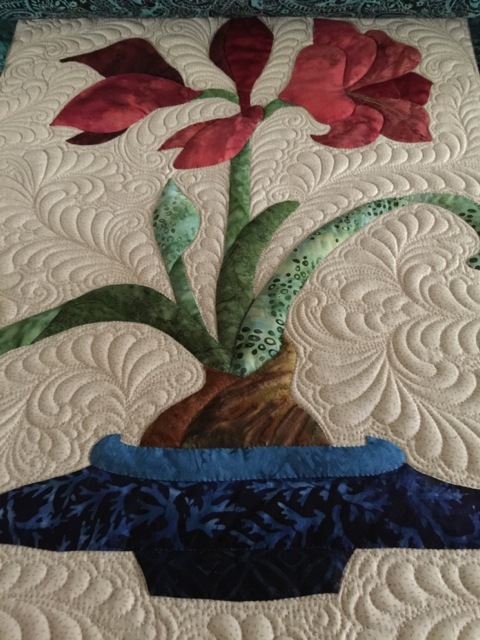 Hi, I'm Marybeth O'Halloran of White Lotus Quilting, on Bainbridge Island, Washington. I'm a professional longarmer who works on an A-1. I've finished almost 700 hundred quilts for clients. This is my tenth year in business and I mostly focus on custom work now. I've had clients win Grand Champion at our state fair with quilts I've done for them and have had quilts featured on pattern covers for Beach Garden Quilts. 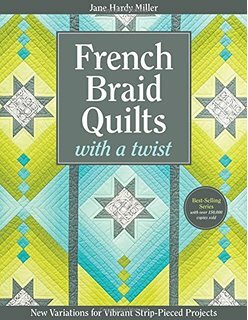 Also I quilted several of the sample quilts in Jane Hardy Miller's fourth French Braid book. Wish they'd sidelighted those quilts in the pics so you can see the quilting better! I also design pantographs for UrbanElementz. 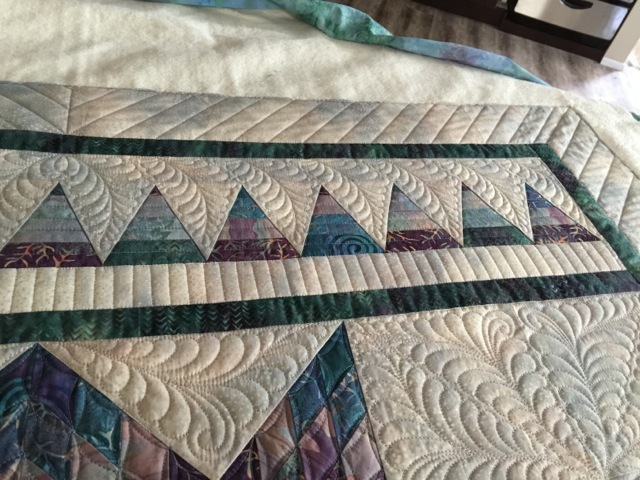 .Bonnie Hunter of Quiltville used one of my pantographs, Celtic Curls, for her Celtic Solstice mystery quilt. 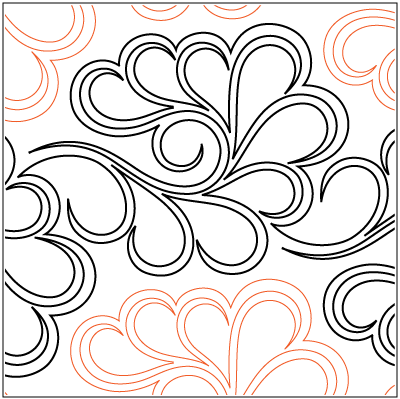 This quilt pattern is no longer on her site as it is about to be released in a new book. 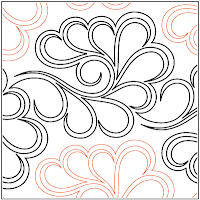 But you can see how other quilters interpreted her pattern if you like -- Definitely check it out! This is a recent custom quilt I finished for a client, with my favorite cotton batting, Dream Cotton Select. 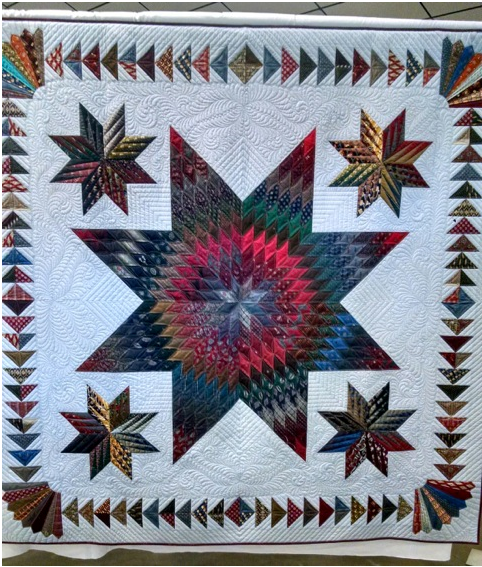 This quilt is a lap-sized broken star in soft teals and burgundies, made by Margaret Mathisson of Poulsbo, Washington. And quilted by me of course! 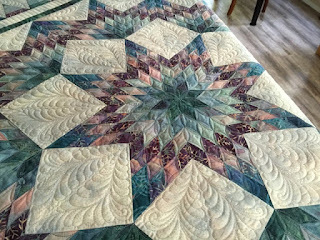 The feathers are custom designed for the quilt -- usually on a broken star I do feather wreaths in the surrounding diamonds, but the size of these was just short of my 6" minimum for wreaths, so I came up with a different radial feather for the diamonds. I thought they would go nicely with the cascading feathers on the borders. Everything is hand drawn as I don't own a computerized system. On this quilt I love how the Dream Cotton Select (midloft) gives just enough to show the detail of quilting but is still supple enough for good drape, even with lots of quilting! 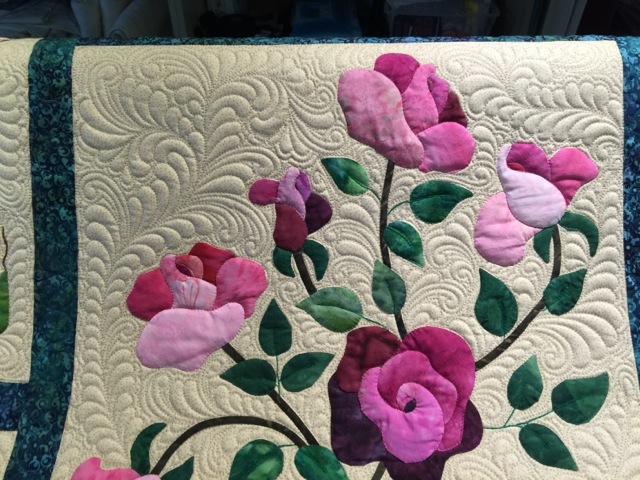 On most quilts I use just a single layer of batting but for applique I love to use two layers: a thin cotton for structure and a Wool or Silk top layer to lift the appliques. If you quilt densely next to the appliques they fill with the loft of the airy batting and look a bit like they've been trapunto-ed. 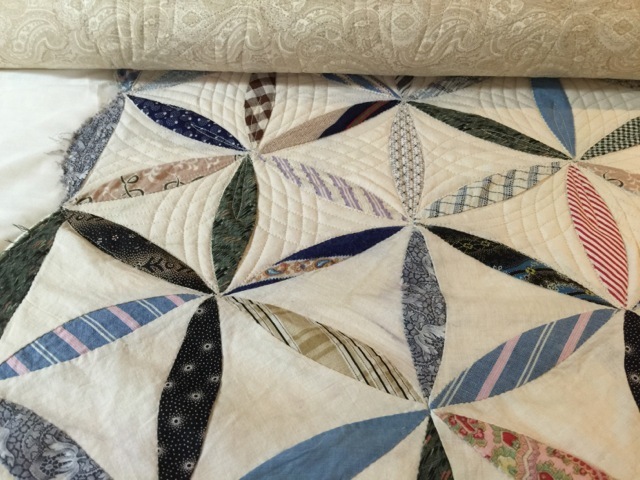 I am inspired by the crazy mad skills of the quiltmakers I get to meet through their piecework, including those long forgotten patchworkers who made vintage quilts. I love finishing vintage tops into quilts with modern backs -- they're like little time travelers! 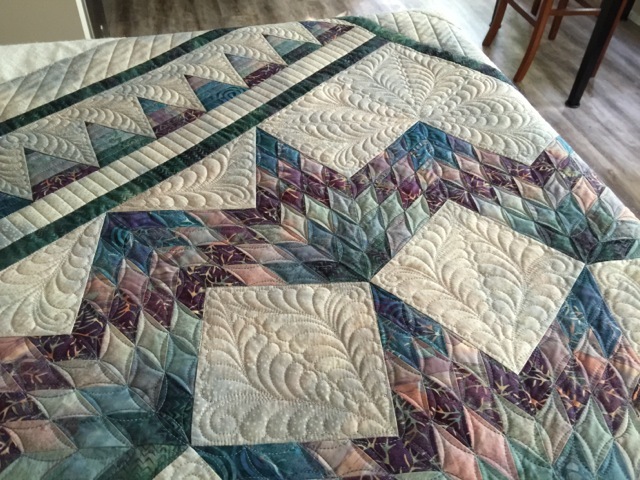 Like this recent vintage quilt I finished for a client, Sally Kuhn of Bainbridge Island, who owns Sash Mercantile. I put the soft paisley on the back. The pattern is Joseph's Coat, it was hand-pieced, and I believe some of the fabrics can date to the late 1800's or early 1900's (the indigos and mourning-style prints). I quilted stylized curved cross-hatches on this one. Quilters are the most amazing people, always there to lend a hand, to comfort, to reassure, to encourage and inspire. They perform the most profoundly and deeply touching acts -- to help others, often strangers, feel less alone in an increasingly impersonal world. Like most quilters I donate time and energy (and fabric) to several charities, including two quilt guilds, our local Rotary chapter (who has a 6-acre rummage sale in the summer), and the American Heroes quilt organization. Our small sewing group donates about 1 quilt a month to American Heroes. My cousin John Priestner died in Iraq several years ago and it's something I participate in to honor his memory. Every year during our island's outdoor quilt festival hosted by the Bainbridge Island Modern Quilt Guild, I host a community sew-in to benefit American Heroes. We recycle old dress shirts and telephone book paper and use improvisational methods that just about everyone can try, on my collection of three-quarters sized vintage sewing machines. Instead of ending with a selfie, I'm going to include a pic of a commission quilt that took me four years to finish and won best machine quilting and viewer's choice at our last guild show. The small spiked lone stars are from Karen Stone's book and the lonestar is by Quiltsmart, and it is an original layout. The fabrics are vintage ties -- some 80-100 years old -- and the background is Italian pinstripe shirting. 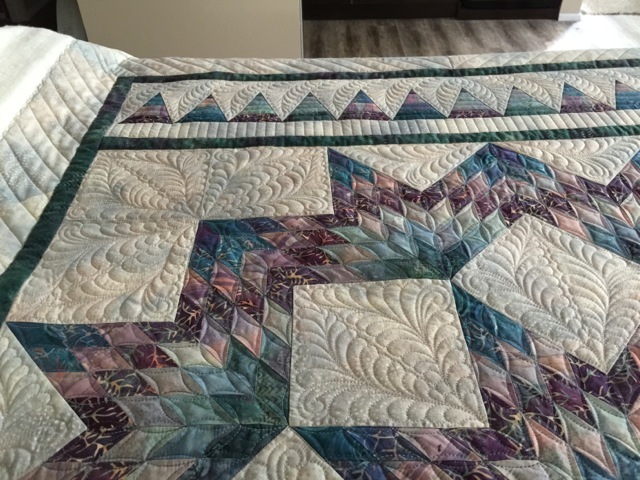 I designed the quilting and hand-drew it all with my machine. Somewhere I have a pic of this with me in front of it and if I find it I'll send it along!